The 3rd grade students received SOOO many compliments when these were up in the hallway! 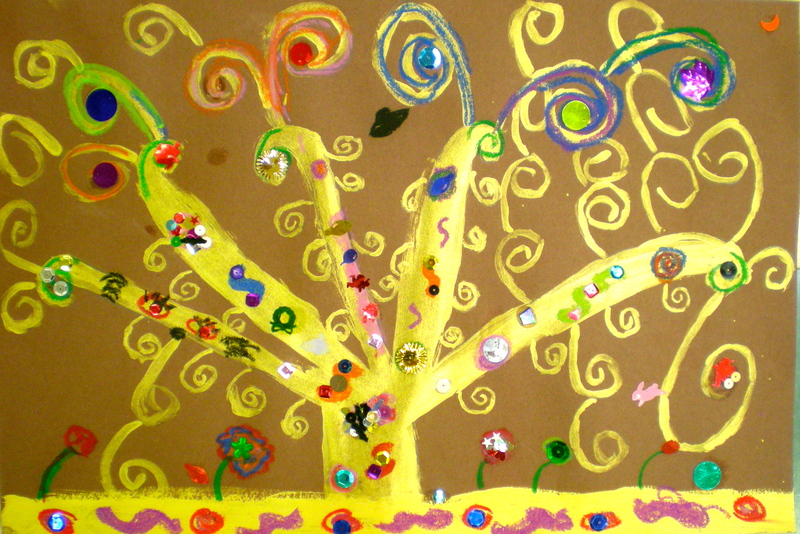 Their hard work was really evident in the carefully painted and drawn swirls reminiscent from the original Gustav Klimt Tree of Life. 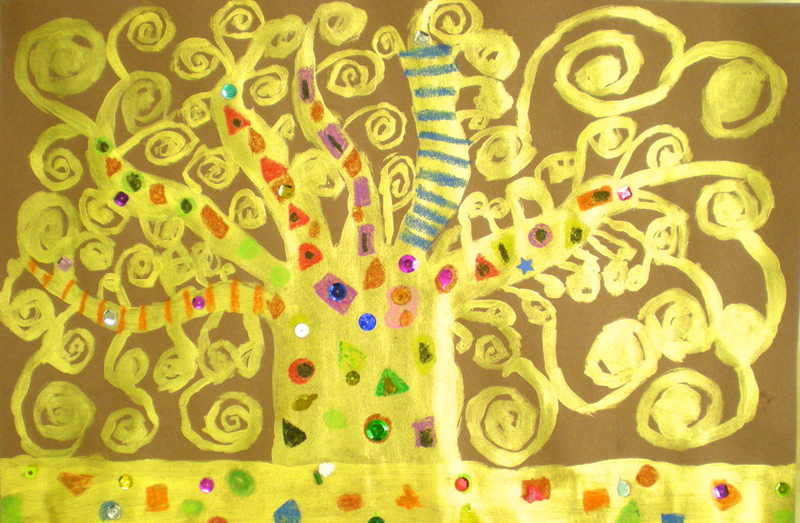 We discussed the concept of the tree of life and how it is depicted in many different cultures. 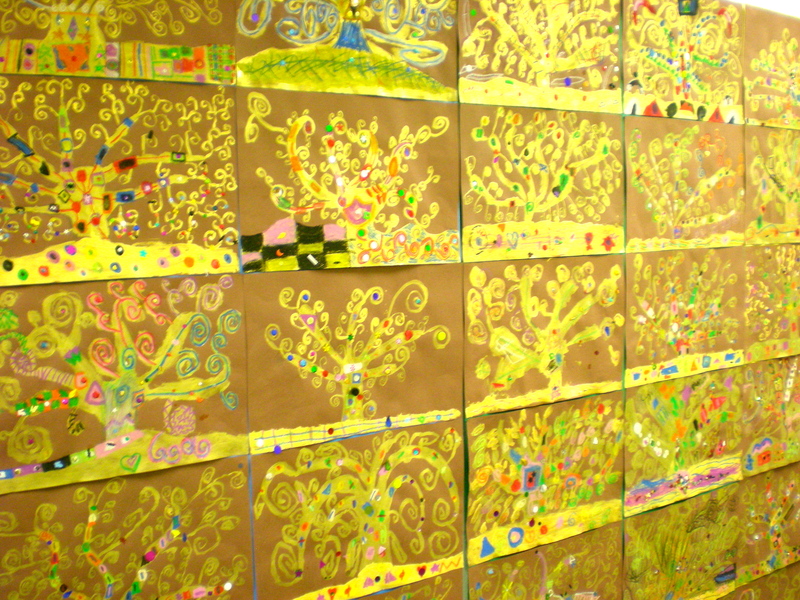 We noted Klimt’s fondness of gold and intricate patterns and details, while making careful observations of the patterns and shapes seen in Klimt’s Tree of Life. 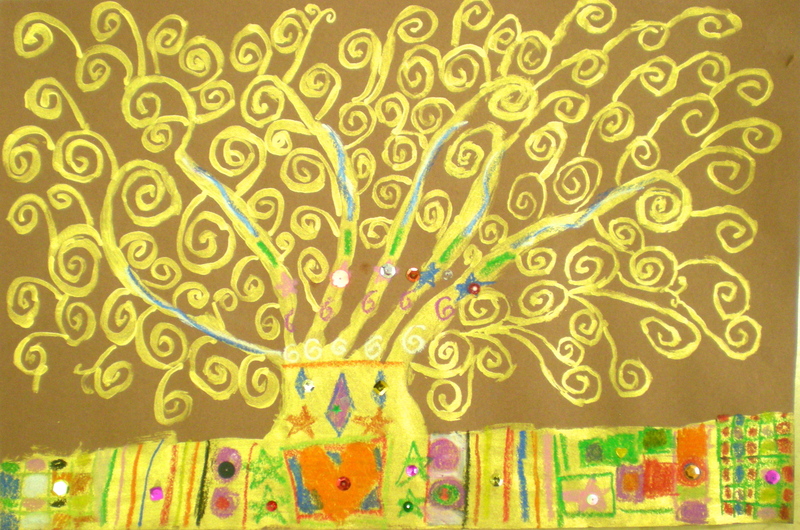 I can demonstrate my understanding of Gustav Klimt‘s painting style by producing my own version of the Tree of Life. I can take my time to carefully paint the swirls of the tree, and demonstrate my understanding of Klimt’s style by creating symbols similar to his. 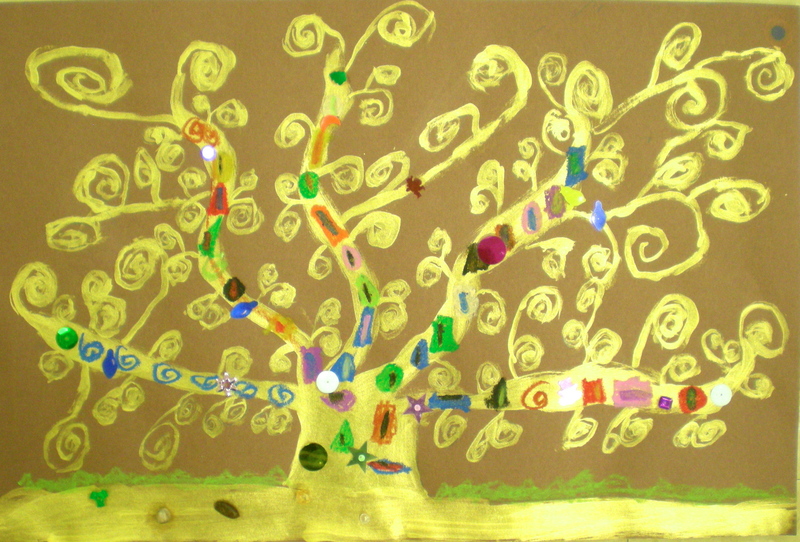 I can use pastels to add pattern and design to my tree inspired by Klimt’s symbols. This project was borrowed from my practicum teacher and her blog. The kiddos are so proud of their results, and I am honestly blown away with their confidence and abilities to rise to this drawing challenge. Leonardo da Vinci, one of the most influential artists to develop and identify universal facial proportion (among his other extremely famous paintings and inventions), was our inspirational artist for this project. We really took our time to practice and grow comfortable making portraits with correct proportions in order to make them look realistic. We concentrated on specific features, perfecting them as much as we could before beginning our final portraits. To help our shading practices we created a value scale to help us match the correct values for different parts of the face – what truly impressed me with these self-portraits was the amazing shading that really communicated the realism the THIRD GRADERS were aiming to portray. These are amazing! Bravo! I can follow the face-mapping process to create a realistic portrait. I understand that realistic faces aren’t just one color, tint, or shade. After closely observing the face to produce their amazing Meet Me in the Middle self-portraits, I felt it only natural to continue this great practice of observing and recording with an everyday object. Andy Warhol is one of the most, if not the most famous, Pop Artist of all time. Pop Art was really influential in the 1960’s, bringing the mundane, everyday item to the fine art world. We got to know Andy Warhol and his series of Campbell’s Soup Cans to find inspiration in our own mini series of pop cans. 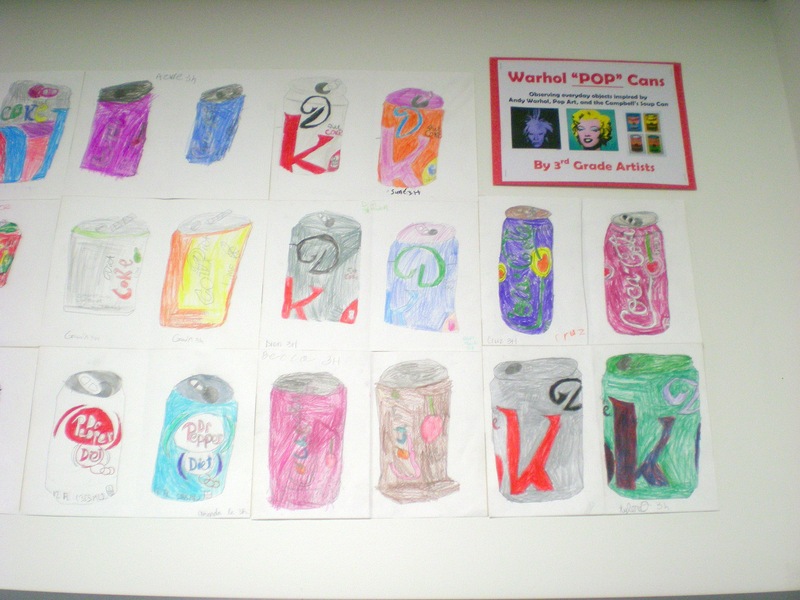 (Pop can and “Pop” Art is also a fun play on words :)). 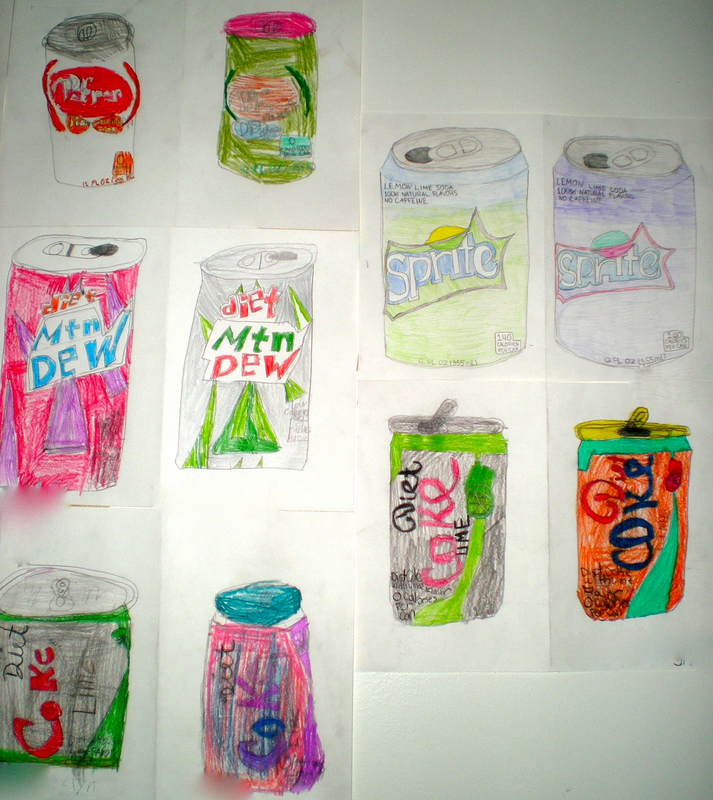 One of the two drawn cans needed to be colored with the exact colors of the real pop can, while the second can could be colored however the student chose in order to simulate the bright colors often found in Pop Art. Here’s a link to this project on my old blog. I can draw a pop can from observation. I can create a realistic looking cylinder. I understand the ideas, colors, and objects used in Pop Art. I understand that Andy Warhol was a famous Pop Artist.